A2Z was contracted by Constellation Power Source, Brandon Shores Power Plant to dispose of a 30 cubic yard roll-off container of NORM (Naturally Occurring Radioactive Materials). The container was loaded with scrap steel and was approaching the scale when it set off the alarm for radiation. The local scrap steel recyclers have a radiation detector installed at the entrance of their scale. Testing determined that the radioactive material was from coal dust that had been introduced into the roll-off container. The scrap metal could have been coated with coal dust when loaded into the container. Radioactivity is naturally occurring when coal is burned. Small amounts of radioactive materials will accumulate. The container had to be off-loaded one piece at a time. Each piece had to be checked with a Geiger counter to determine the level and source of radiation. After off-loading the scrap into a different container, the original container was found to have coal dust caked on the bottom. 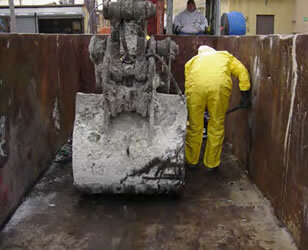 The coal dust was vacated and the container was decontaminated by washing with soap and water. After contacting Pennsylvania Department of Environmental Protection and the Nuclear Regulatory Commission, permission was granted to landfill the NORM waste. The load was transported to and disposed of at Modern Landfill, in York, Pennsylvania.